Melodious or not, Jackinsky is doing it her way. 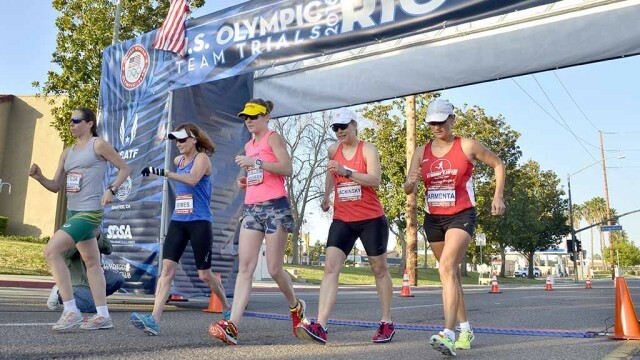 Ten years after starting a company called ReShod to improve race-walking shoes, the resident of Aloha, Oregon, will compete in the National 50-Kilometer Race Walking Championships adjacent to the Mall at Trolley Square at Santee Town Center. Her goals: Qualify for the 2020 Olympic Trials and sell some of her patented shoes. Not bad for a 55-year-old former prep gymnast once told she’d never be an athlete again. Experts are doubtful she’ll meet the likely qualifying standard of 4 hours, 30 minutes, but Jackinsky has a good shot at an American 55-59 age-group record. The listed best is 6:31:52 by Cathy Mayfield in 2008. Women have been race-walking 50K unofficially for years, but it wasn’t until 2017 when the event long confined to men was added to the IAAF championships menu (joining the 20K walk). It’s been recommended for the 2020 Olympics. Santee will be Jackinsky’s fifth 50K. In 2016, she raced an unofficial 31-miler at the Olympic Trials adjacent to Santee High School. That year, former Bonsall resident John Nunn was the men’s winner, qualifying for his third Olympic Games. Nick Christie of El Cajon, who last week was named USA Track & Field Athlete of the Week after breaking a 10K indoor walk record, said on Facebook that he had a pair of ReShod red shoes. Therein lies a not-so-dilemma: Do shoe companies target the millions of casual walkers or craft a model catering to a microscopic market slice? Racewalk.com founder and IAAF technical official Jeff Salvage says if he had to guess, about 10,000 Americans consider themselves race walkers. “But when you say serious competing, you’re under 100,” he told Times of San Diego in a phone interview. Jackinsky, who once worked for Nike, has seen the marketing and production issues up close. That’s where Jackinsky comes in. After working at Nike and Columbia Sportswear (which sent her to China to study lasts and fitting), she started ReShod Walking Shoes LLC in summer 2008 with the idea of putting new soles on old kicks. That business model didn’t last. She stopped resoling in 2016 “mainly because people were running out of shoes to send me,” she said, and newer shoes were problematic with all the embedded gadgets. So that year her one-person company (using contractors and Chinese manufacturers) brought out its first model, the attention-getting red shoe. Jackinsky incorporates patented designs, and has a third one pending for a blue model. Race walkers are generally high on her invention. If she reaches the New York and Maine markets (the only state where high schoolers do race walks), “she could really do well,” he said. Ben Young, commenting on Facebook, calls the shoes terrific for race walking. But Sandy Matson says she bought a pair ($145 retail) and “sadly had to return them as the cut around the ankle bone was too high and hit my ankle bone.” She hopes the new blue ones coming out will address that issue. Darlene Backlund of Palm Springs, a masters record-setter in her early 70s — who bought her first pair of ReShods after trying out a prototype in June 2016 — says she got them in time for the national 50K in January 2017. Elite walker Michael “Giuseppe” Mannozzi of Ohio says he was skeptical but promised Jackinsky at the 2016 Olympic Trials that he would try her shoes. She’s pleased with the latest shoe, but would like an even a lighter model. And Michael “Cappi” Capozzoli of Sedona, Arizona, says he recently walked from Dana Point to Boston — 3,200 miles — primarily in ReShods. 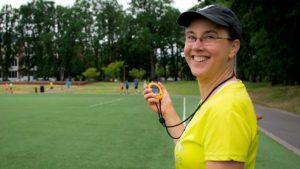 Race walk guru Salvage, a computer science professor at Drexel University in Philadelphia, has written or co-written eight books on the heel-toe-heel-toe sport, including four with Cuyamaca College cross country coach Tim Seaman, a two-time Olympian. He says Jackinsky has little competition, since New Balance no longer makes race-walk shoes and a small Massachusetts company called Hersey — named after founders Bart and Jan Hersey of Maine — offers shoes starting at $200. “He sold to another guy who’s not quite as hip on the race-walking stuff, and I’ve not been recommending them much,” Salvage says of the pricey Hersey model. Salvage advises Jackinsky to supply free shoes to elite walkers — whose testimonials could generate sales. “You’ve got a couple hundred diehard race walkers in this country who could easily go through four pairs of shoes a year, so you could easily be selling thousands of copies of the shoe,” he said from his home in Medford, New Jersey. 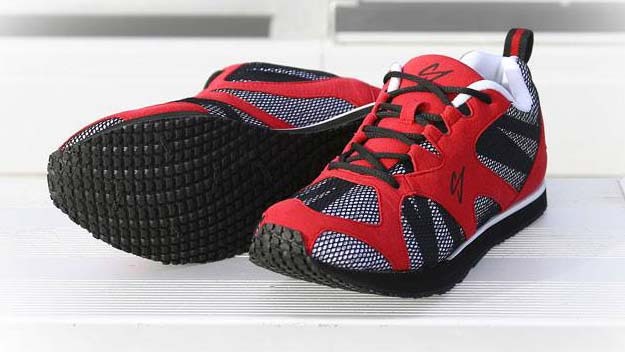 So how did Jackinsky come to be Queen of Race Walk Shoes? Carmen was a gymnast when she “did something I shouldn’t have been doing” — trying a triple front flip after a high school meet. She “opened up” at the wrong time, landing on her stomach. A San Diego Chargers team doctor told her she’d never be an athlete again — even saying cycling would be too hard on her back. “I was devastated,” she said. “I was a gym rat … up to six hours a day. Now all of a sudden I was nothing. I had no future as an athlete.” In pain, she became depressed. When she found the women’s 20K event was added to the Olympics in 1992, “it kept me hooked. But I didn’t like the shoes.” So she started “doctoring up” her Nike Spirit running shoes. Meanwhile, she met Craig Jackinsky in a Grossmont physics class. Eventually trained as a paralegal at the University of San Diego, she didn’t think of footwear when she moved to Portland, Oregon. She got a “really cool” marketing job instead. She later worked for Columbia Sportswear, where she was sent to China and “learned all about lasts and fitting.” But like Nike, they lacked interest in helping design a race-walk shoes. But recalling her gymnastics past, she designed a shoe inspired by a vaulting horse springboard. Jackinsky experimented for years until she figured out the “densities and combinations and the angles” by feel underfoot. “I kind of did it backwards from what engineers would,” she said. Her latest patent and design features what she calls a “zero drop” — the distance from the heel to the ground is the same as the ball of the foot to the ground. Footwear giant adidas tested her concepts for a year but said it wasn’t interested. But the German firm secretly continued the project. Nike hired Jackinsky as a coach, and she worked there 12 years in its fitness center as a trainer. She continues to coach, her business fed by folks preparing for the 130-mile Portland to Coast Walk Relay. If a women’s 50K Olympic Trials is held, she expects the qualifying time to be about 5 hours, 45 minuets. But he hurt his knee and never got to race. Salvage wants to see Jackinsky carry on in his footsteps. Now 5-foot-6 and 149 pounds (compared with her “buff” pre-puberty 5-5 and 125), Jackinsky is going through menopause but takes no hormones. She avoids chocolate and caffeine to deter hot flashes. Her childhood dreams remain bright, too. Jackinsky tells how, as a 12-year-old in Illinois, she sold Chicago Tribune newspapers. In 1976, she won a contest to get new subscriptions. The prize: three days and two nights at the Montreal Olympics. She took an autograph book from fifth grade and, while headed to a restroom, ran into boxing brothers Michael and Leon Spinks. Soon the former Santeean will be back, banging out laps of a 31-mile race.